THE MOST FAMOUS CLIPPER of them all, the Cutty Sark. She was designed to rival the Thermopylae, and had an iron frame planked with wood, and a displacement of 1,970 tons. The Cutty Sark, with a tonnage of 963 gross and 921 net, was of a heavier build than her rival, and had more elaborate fittings. She made her maiden voyage from London to Shanghai in 104 days. WHENEVER racing clippers in their prime are considered it is difficult to keep the mind off the Thermopylae and the Cutty Sark. Their design was the high-water mark of the type. It is difficult to decide which deserves the title of the finest clipper built. They were designed as rivals, and there is little material on which to base an accurate estimate of comparative value; yet they were both wonderful ships and their very names carry their own romance. The pity is that they were built at the end of the true clipper era, when the opening of the Suez Canal was about to ruin the China tea clipper business for which they were primarily designed. The Thermopylae was built first, in 1868, the Cutty Sark being designed in the following year expressly to beat her. The former would seem to have had the initial advantage. 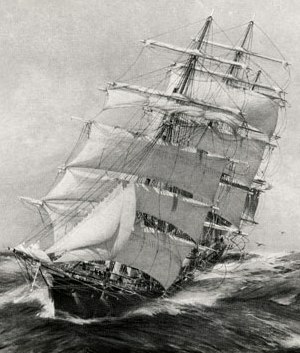 She was built to the designs of Bernard Waymouth, a brilliant naval architect of his day, by Walter Hood of Aberdeen, for George Thomson’s Aberdeen Line; both builder and owner had a high reputation and an association of many years’ standing. The Cutty Sark, on the other hand, was built by Scott & Linton, an unknown Dumbarton firm, to the designs of Mr. Hercules Linton, who still had his name to make. Her owner, Captain John Willis, familiarly “Old White Hat”, was a master mariner with a sound knowledge of ships and their running, but his thrifty methods frequently had unsatisfactory results. The fact that the second ship was built when the features of the first were known will account for the similarity of their external design. Both were composite full-rigged ships - that is, they had iron frames planked over with wood - and both had a displacement of 1,970 tons at load draught. The dimensions of the Thermopylae, according to Lloyd’s Register, were 212 feet between perpendiculars, 36 feet beam by 21 feet depth of hold; those of the Cutty Sark were the same, but with 6-in more length. But the tonnage of the Thermopylae was 991 gross and 948 net, while that of her rival was 963 and 921. The Thermopylae was more lightly built; the Cutty Sark had more elaborate fittings, including a teak deck instead of yellow pine. Perhaps because of this the Thermopylae has often been regarded as the faster ship in lighter winds, but the Cutty Sark was superior when the wind had any force. BATTLING AGAINST THE ETERNAL ENEMY. The clipper Thermopylae making her way through a heavy sea. This vessel, built in 1868, had an iron frame planked over with wood and a displacement of 1,970 tons at load draught. The dimensions were 212 feet between perpendiculars, 36 feet beam by 21 feet depth of hold. Tonnage of the Thermopylae was 991 gross and 948 net. The clipper left Gravesend, Kent, for Melbourne on her maiden voyage in November, 1868. She anchored at Melbourne after sixty-two days out from the Lizard. This constituted a record, which still stands for sailing ships. The Thermopylae was ready for sea at the end of 1868, and on November 7 left Gravesend, Kent, on her maiden voyage for Melbourne under the command of Captain R. Kemball. Not a regular master in the Aberdeen Line, Kemball had been chosen for the reputation he had made while in command of the Yangtse, normally a slow ship, but one in which he had beaten crack vessels. The Thermopylae passed the Lizard 33 hours from Gravesend; 21 days out saw her crossing the Equator - that day she sailed 288 miles. Finally, she anchored at Melbourne 62 days from the Lizard, a record; and, having discharged her outward cargo, went on to Newcastle, New South Wales, to load a cargo of coal for Shanghai. This passage she did in 28 days, pilot to pilot, which was another record. Having loaded tea, she left the Pagoda Anchorage in early July and made a passage of 91 days home against the monsoon. This was a third record, but twelve days later Sir Lancelot, under Captain Robinson, arrived in the Thames, having done the passage in 89 days, which is still the record for a sailing ship from China against the monsoon. The Thermopylae had made her reputation for speed, and Willis was determined that his new ship the Cutty Sark should beat her in the 1870 season. On her second voyage the Thermopylae ran from Gravesend to Melbourne in 71 days and homeward from Foochow to London in 105 days. She was away before the Cutty Sark was launched, the latter ship not being completed for sea until January 13, 1870. It has been mentioned that her builders were young and inexperienced, and shrewd John Willis had insisted on a guarantee being given by a responsible party. Old Peter Denny, of the historic and rival shipbuilding firm in Dumbarton, generously lent the weight of his name. It was necessary; before the ship was launched the company’s money had run out and work had to be suspended, but at a meeting of creditors it was decided to complete the work under Denny’s supervision. This delayed the launch. There were unfounded rumours that this change resulted in work aloft being scamped, but the Cutty Sark was finished with the pride that has always distinguished Clydeside labour. There is little doubt, however, that she had not been designed aloft with the same skill as had been shown in the lines of the hull. Her maiden voyage from London to Shanghai, which must inevitably have been a poor one owing to the remarkably light winds that handicapped her the whole way, was made worse by repeated failures of the ironwork aloft. But the Cutty Sark did the passage in 104 days, not a record voyage but by no means a poor trip. She sailed from Shanghai about a month before the Thermopylae left Foochow carrying a cargo smaller by about 10,000 lb, and made the homeward passage in 110 days against the other’s 105. But Captain Moodie’s propensity for cracking on sail had shown many more weak spots aloft which had to be repaired at sea. STILL ON DUTY. The Cutty Sark carried the Red Ensign with honour and distinction until 1895, when she was sold to a Portuguese firm for about £2,000. After many years of tramping service the vessel found refuge at Falmouth Harbour, in Cornwall, where she is now used as a training ship for boys. In 1870 the Thermopylae had a keen race outwards against the beautiful Norman Court until their tracks divided, and she finished with a passage of 66 days to Melbourne. The Cutty Sark went from London to Shanghai in 101 days and then found herself with time for a ballast trip to Bangkok and back to China with a cargo of rice before she was due to load tea. But the Suez Canal was now open and the steamers were beginning to capture the tea trade to an extent which was to eliminate the clipper altogether. The Thermopylae was content with a low freight and, sailing from Shanghai in June, made a homeward passage of 106 days; the agents of the Cutty Sark at first scorned to cut freights, but eventually she sailed in September at the lower rate and made a passage of 108 days. The chance of a direct race between the two ships, which were regarded as the great rivals on the trade, had been missed. But it came on the next voyage after the Thermopylae had made an outward passage of 67 days from London to Melbourne, two of her days’ runs being over 330 nautical miles, and after the Cutty Sark had raced out to China against Sir Lancelot, beating her by five days with a passage of 108 days, which was not the best of the year. With the tea clippers still in their old place in public and professional estimation, despite the fact that they were doomed by the steamer, this straight race attracted intense excitement. Both Captain Kemball and Captain Moodie were front-rank master mariners and had several years’ valuable experience of their ships. Both were willing to sacrifice some freight so as to trim their ships to a nicety and to heed neither cost nor effort to get away first. The Cutty Sark was successful; but, since fog delayed both ships for some days, they eventually started level. Off Hong Kong the Thermopylae passed her rival; four days later the position was reversed. From time to time they sighted one another, and the excitement was intense, but the Willis clipper was out of luck. Her sails were frequently damaged, waterspouts forced her off her course and compelled her to take in sail; but at Anjer Point, Java, there was little more than two hours’ difference in their times and they were through the waters in which the Thermopylae had the advantage of Captain Kemball’s knowledge of the China Seas. 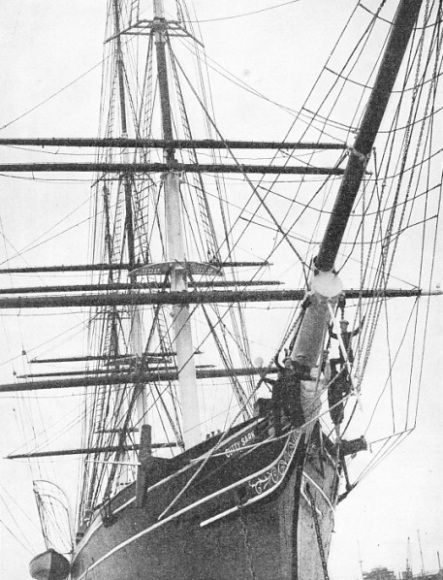 In the Indian Ocean strong winds gave the Cutty Sark her chance, but she lost more canvas, and at the end of the gale a heavy sea tore the pintles out of the rudder, which immediately washed away and left her helpless. The expedient of towing a spar over the stern to steer the ship proved useless; but Moodie refused to admit defeat and put into a South African port. He cut a spare spar into three pieces, with which he made a remarkably serviceable jury rudder. This was secured to the stem post, but it could not, of course, be controlled by the wheel in the ordinary way. The ship had to be hove-to while the work was in progress and the Thermopylae made the most of her chance, although unaware of the misfortunes of her rival. A stowaway, who had been brought up in a Scottish smithy, was discovered, and he did the necessary blacksmith’s work. Captain Moodie, however, was the moving spirit, and it was his skill which permitted the makeshift to be shipped in a heavy sea. Had he no other feat to his credit this piece of “sailorizing” would have given him a permanent reputation among seamen. But he could no longer force the ship, even with the knowledge that the Thermopylae would be steadily increasing her lead. The bad luck of the Cutty Sark continued. As she rolled in the doldrums the fastenings of the jury rudder gave way and it had to be taken inboard and fixed afresh. Yet, despite these set-backs, she finished her passage 119 days from dropping her pilot and 122 days from Shanghai, while the Thermopylae’s passage was 115 days. Considering the handicap under which the Cutty Sark ran, she won a moral victory, and her captain became a national hero. But, during the voyage, Moodie had quarrelled with his owner’s brother, who was a passenger, and insisted on resigning his command and taking over a steam liner in a company whose subsequent bankruptcy almost ruined him. FROM THE POOP. A view of the deck of the Cutty Sark. 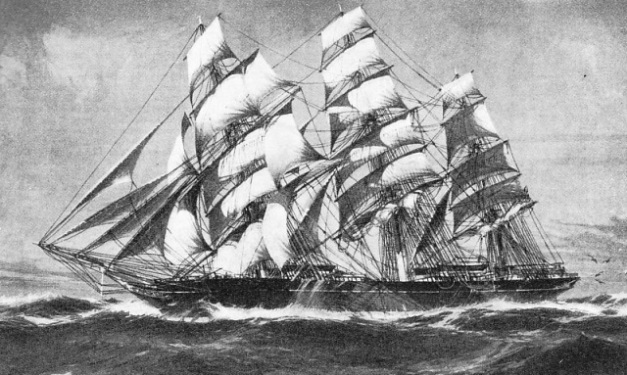 In 1875-6 the Cutty Sark and her rival, the Thermopylae, raced from London to Australia. Owing to an early mishap the Cutty Sark took seventy-five days against the Thermopylae’s sixty-eight. On the homeward journey the Cutty Sark did the passage in 108 days, beating her rival by seventeen days. After that mighty race, the best passages on the China tea trade appeared an anti-climax, especially as the business was obviously ruined. The two vessels, however, remained on it for some time. In 1875-6 the two ships arranged an outward race, the Cutty Sark leaving London for Sydney nine days before the Thermopylae sailed for Melbourne. But a collision at the beginning of the voyage which cut down the Cutty Sark’s sail area, and a captain who could not crack on sail in the manner of the old-timers, resulted in her passage being 75 days against the Thermopylae’s 68. Home with tea, the Cutty Sark made a passage of 108 days and the Thermopylae one of 125, but the crack Glen Line steamer on the service did it in 42 by way of the Suez Canal. In 1877 the position was reversed, the Thermopylae doing the passage from Shanghai in 102 days against the Cutty Sark’s 127. Outward bound later in the year, the Cutty Sark was damaged in collision in a gale, but her second sailing was sufficiently close to that of the Thermopylae to make a race of it; she took 72 days to Sydney against the other’s 74 to Melbourne. The two ships were then again in rivalry from Sydney to Shanghai with coal, the Cutty Sark doing the passage in 40 days and the Thermopylae, sailing nearly a month later, in 48. The two rivals were then parted for a time, the Thermopylae running straight home to London from Sydney, while the Cutty Sark went tramping, finishing with a fine run of 19 days from New York to the Downs. Captain Willis transferred the Cutty Sark to the Australian run in the face of contrary advice and despite his own doubts as to how his little ship, with her fine lines, would fare on the wool trade. 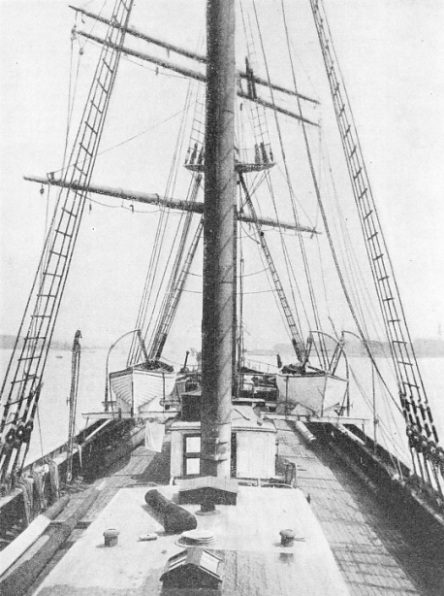 For this she was drastically cut down aloft in the spring of 1880, her sky sail being suppressed and both masts and yards shortened. When she had a strong breeze this affected her little, but in the light airs she was ruined. That largely explains the number of ships which can justly claim to have beaten the famous Cutty Sark. Captain Moore, and Captain Woodget who followed him, restored the ship to her old position. They were both first-class sailors who had learned their craft in the north-east coast coal trade and were “characters” in their way. he two ships were again in rivalry on the Australian wool trade in the ‘eighties - the Cutty Sark beat the Thermopylae by seven days in 1884-5 - but in 1889 the Thermopylae was sold to W. H. Ross and Company, of London, and resold to a Canadian company. She had already had her sail area reduced twice as a ship, but now she was cut down to a barque, her owner maintaining that little difference was made to her speed. But her days were numbered, and in 1895 she was sold to the Portuguese Navy to be converted into the training ship Pedro Nunes, and she seldom left the Tagus. She was made a target for torpedo practice in October 1907, and sunk off the river mouth. The Cutty Sark continued to carry the Red Ensign with the greatest credit under Captain Woodget until the summer of 1895, when she also was transferred to the Portuguese flag. Narrowly escaping destruction in a hurricane in the West Indies, she was salved and continued tramping, visiting Britain several times in the early days of the war. In 1916 she was towed into Cape Town, dismasted, and re-rigged as a barquentine. When she visited London in 1922 her arrival caused considerable interest. 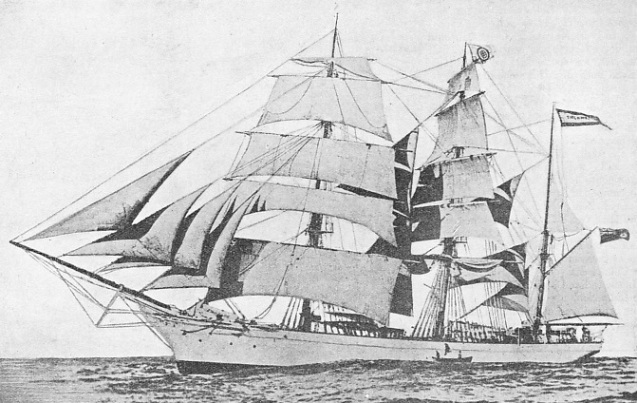 Captain Wilfred Dowman, a sailing-ship man of great experience, and his equally enthusiastic wife, bought the vessel and restored her to her old ship rig. She is preserved in Falmouth Harbour, in Cornwall. DROPPING THE PILOT. The Thermopylae off Cape Flattery,Washington, United States of America. In the ‘eighties the clipper was engaged on the Australian wool trade. But in 1889 she was sold to a Canadian company, and converted to a barque. The ship was for a time employed between British Colombia and Hong Kong. In 1895 she was sold to the Portuguese Navy; and in 1907 she was sunk during target practice.